These succulent lamb chops, cooked in a fruity sauce, make a quick and easy meal. They’re delicious served with a pile of buttery mash. In a shallow, non-metallic dish, mix together the red wine vinegar and redcurrant jelly. Strip the leaves from the rosemary stalks, set a few aside to garnish, then finely chop the remainder. Stir into the redcurrant jelly mixture along with the garlic. Cut 4 wooden skewers down by about a third and use them to spear the chops. This will hold them in place during cooking. Add the lamb to the redcurrant jelly marinade and leave for 5-10 minutes, turning once. Heat the oil in a large frying pan over a medium heat. Add the lamb with its marinade and cook for 15-20 minutes, turning halfway through, until the meat is cooked to your liking and the sauce has reduced to a sticky consistency. Garnish the lamb with the reserved rosemary and serve with mashed potato and steamed purple-sprouting broccoli. 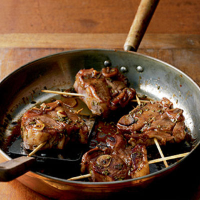 Use succulent Welsh lamb for this dish, when in season. The rich fruity flavours of Spanish wine, make it a good match for this dish. This recipe was first published in October 2007.